Why all the hushed excitement and bulging necks? Tonight is this town's favorite night of the year. May 11 is when all good, red-blooded Michiganders gather in the middle of the busiest road and burn their snowsuits. Separate coats and snowpants are not allowed. Only one-piece, ugly-colored, humiliating, adult-sized snowsuits will be burned in front of God tonight. Doing so will please our Lord and stave off Winter's bite later this year when the majority of us are left naked, shivering and suddenly illiterate under the first snowfall. Why all the hushed excitement and bulging necks? Tonight is this town’s favorite night of the year. May 11 is when all good, red-blooded Michiganders gather in the middle of the busiest road and burn their snowsuits. Separate coats and snowpants are not allowed. 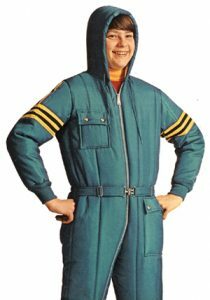 Only one-piece, ugly-colored, humiliating, adult-sized snowsuits will be burned in front of God tonight. Doing so will please our Lord and stave off Winter’s bite later this year when the majority of us are left naked, shivering and suddenly illiterate under the first snowfall.